We have one or two nights a week when we need to have a no-muss-no-fuss, almost-no-cleanup-afterward, make-ahead meal. And since it's spring and we really do need to start eating more salads, I’ve been thinking of making one of them a Salad Night. There’s always quinoa in the cupboard, though I haven’t actually cooked any in months. And there’s always canned chickpeas (garbanzo beans). 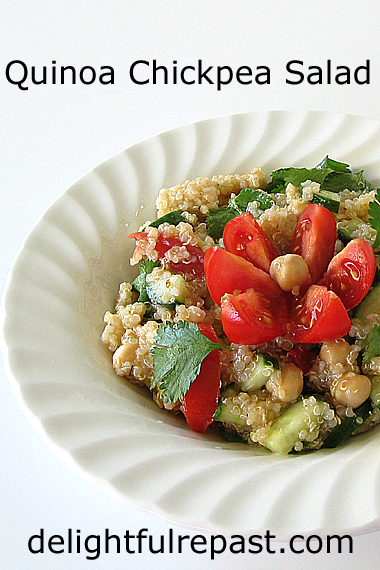 Together, a cup of quinoa and a can of chickpeas has about 45 grams of protein, making this a great vegan main dish. 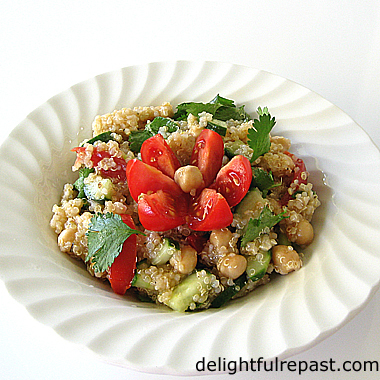 And since quinoa is actually a seed rather than a grain, Quinoa Chickpea Salad is a suitable dish for those on grain-free or gluten-free diets. This is really one of those not-a-recipe recipes, so you can add and subtract vegetables and seasonings at will. What is your favorite salad ingredient? 1 Rinse quinoa in a large fine-mesh strainer with cold water. Pour it into a 1.5-quart saucepan and add the water. Bring to a boil. Reduce heat and simmer, covered, for about 15 minutes until all the water is absorbed. Set aside to cool. 2 Put cooled quinoa in a large (at least 3-quart) bowl. Rinse and drain chickpeas in the strainer and add to the bowl. Add cucumber, tomatoes and cilantro. Pour the remaining ingredients directly into the bowl or, if you prefer, make the dressing separately and mix it in. Taste and adjust seasoning. 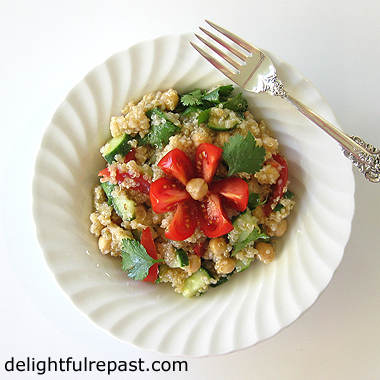 Note: You might also like my Tabbouleh - Made with Quinoa Instead of Bulgur. English teacakes are delightful warm from the oven, but they really come into their own when they’ve cooled and been split and toasted, up to two days later. Here in the US, various cookies and cakes are called teacakes, and in Scotland a teacake involves marshmallow and chocolate. 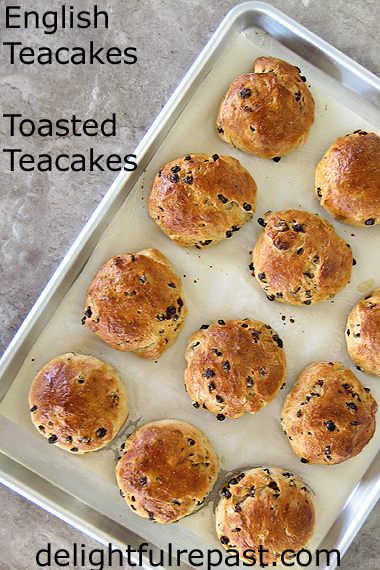 But in England (most of it, anyway), a teacake is a lightly sweetened and spiced, currant-filled (you can also use sultanas or other dried fruits) yeast bun, usually served toasted and generously buttered. Also enjoyed at breakfast, they are perfect for elevenses and afternoon tea. I imagine myself in a cozy English cottage toasting them over an open fire. But having neither an open fire nor a set of toasting forks (never mind the English cottage! ), I make do with a toaster or broiler. The teacakes are split and toasted on the cut sides only under the grill (UK)/broiler (US). Fortunately, our two-slice toaster has what the manufacturer calls a bagel button that toasts just one side. Put the cut sides facing out, push down the lever, then press the bagel/teacake button. Spread your toasted teacake with lashings of organic unsalted butter—no need for jam—and enjoy with a nice cup of tea. 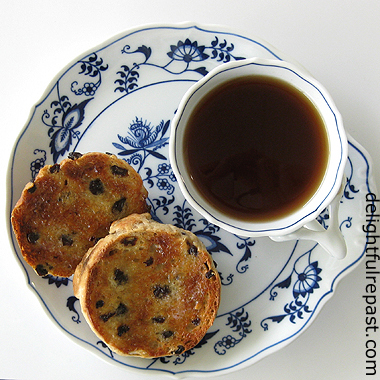 Have you ever had toasted teacakes? If not, start the lovely tradition today! * Since the mixed spice, a ready-made blend popular in the UK, is not readily available elsewhere, you may have to make your own. The amount to make depends on how frequently you’ll be using it. I usually stir up enough for 3 batches of teacakes, but just multiply these amounts if you’d like to make more: 3/4 teaspoon each allspice and cinnamon, 1/2 teaspoon mace or nutmeg, 1/4 teaspoon each cardamom, cloves, coriander and ginger. 1 In 1-quart saucepan, heat the milk just until tiny bubbles start to form around the edge of the pan. Add the chunk of cold butter and stir until melted. 2 Measure 1/4 cup (1.25 ounces/35 grams) of flour and set aside. In 2-quart mixing bowl (I use this 2-quart glass measure – makes it easy to see when dough has doubled), whisk together 2 3/4 cups (13.75 ounces/390 grams) flour, sugar, yeast, spice and salt. Stir in currants, separating any that are stuck together. Make a well in the center. 3 Pour the warm milk mixture and beaten egg (don't forget to take out 1 tablespoon of it) into the well. Mix the flour in to form a soft, but not overly wet, dough. The dough should not be sticking to the bowl too much, but come away fairly cleanly. 4 Working from the remaining 1/4 cup (1.25 ounces/35 grams) of flour, lightly flour the work surface and turn the dough out onto it, Clean out the bowl (no need to wash it) and lightly oil it. Knead the dough, using flour from the 1/4 cup, until it is very smooth and silky, about 5 to 10 minutes. Put the dough into the lightly oiled bowl, cover,* let rise until at least doubled, about 2 to 3 hours. * If you're using plastic wrap, tear off a 15-inch long piece so that you can use it again to cover the shaped teacakes. 5 Line baking sheet (I use this heavy-duty half sheet pan) with parchment paper. Divide the dough into 12 equal pieces--I, being who I am, 😁 weigh the batch of dough in grams (on this food scale) and divide by 12. Shape each piece into a ball. Give it a little roll on the unfloured counter, a motion sort of like moving a computer mouse around, to make a smooth ball. 6 Place in 3 rows of 4 on prepared baking tray. Flatten each gently into a 3-inch disk about 3/4 inch (2 cm) thick. If using plastic wrap, spray with cooking spray the same piece of plastic wrap you used to cover dough, cover* buns lightly and let rise about 1 hour or so. They will not be doubled, just puffy. 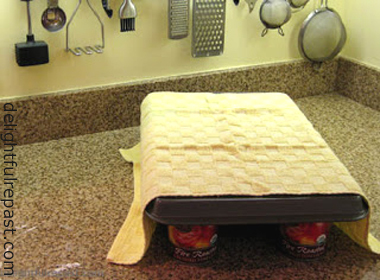 * I use this half sheet pan cover for proofing buns. 7 During last 15 or 20 minutes (depending on your oven), preheat oven to 400F/205C/Gas6. 8 Just before popping them in the oven, brush the buns with the reserved eggwash. Bake for about 20 minutes, or until golden brown. Remove buns from baking sheet and place on wire rack to cool. 9 Then just split, toast, slather with butter, and Bob's your uncle! Disclosure: We are a participant in the Amazon Services LLC Associates Program, an affiliate advertising program designed to provide a means for us to earn fees by linking to Amazon .com and affiliated sites. Classic white sandwich bread came to mind this week because I was craving simple bread and butter tea sandwiches with my tea. But I couldn’t actually make it (or anything else) because I just had hand surgery. Then I thought about the blog—what am I going to do about this week’s post? I don’t like repeating posts, but under the circs, it seemed necessary. And besides, this bread was one of my first posts eight years ago, so none of you probably even saw it. But I wanted to tell you anyway, in the interests of full disclosure and all. 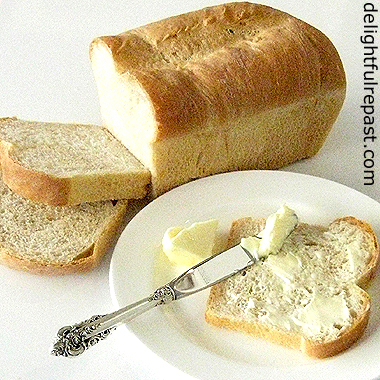 Classic white sandwich bread is something anyone who wants a reputation as a cook needs to master. Even if you really can't cook a lick, if you can make yeast bread everyone thinks you're some kind of cooking genius. Seriously, yeast bread (and pie crust) really impresses people. Master these and you'll be able to fake it as a cook for the rest of your life. 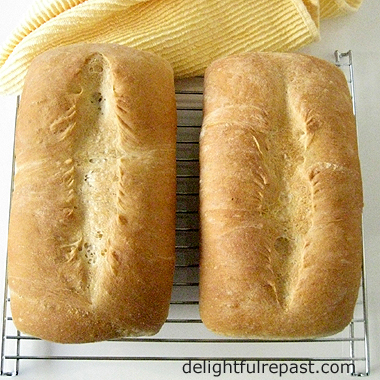 If you've never made bread before, just follow my can't-fail step-by-step below. If you prefer to use a heavy-duty stand mixer for mixing and kneading bread dough, here is the same Classic White Sandwich Bread - Stand Mixer Method. 1 In large bowl (a straight-sided 4-quart bowl makes it easy to tell when dough has doubled), whisk together 2 cups flour, sugar, salt and instant yeast. With dough whisk or large wooden spoon, stir in liquid and butter or oil until thoroughly mixed. Stir for 1 or 2 minutes, then stir in 2 1/2 cups flour a half cup at a time. Finished dough will be shaggy and sticky. 3 Remove dough from refrigerator and let rest for 1 hour to warm up a bit. Scrape dough out onto lightly floured (from remaining 1/2 cup) surface. Knead for about 5 or 6 minutes, adding more of remaining flour as needed to keep dough from sticking. Cover dough with plastic wrap and let rest a few minutes while you clean out and oil bowl for second rise. 4 Flatten out dough and continue kneading for another 5 or 6 minutes, or until dough is soft and smooth. Place dough in oiled bowl, turning dough to oil surface and pressing it flat. Cover with plastic wrap and set in warm (82F/28C is ideal) place to rise until doubled, about 1 hour. If house is cool, heat oven to 200F/93C, allow to heat for 2 minutes, turn off oven and put dough in to rise. 5 Lightly oil two 8 1/2-by-4 1/2-by-2 1/2-inch (also called 1-pound) loaf pans. Turn risen dough out onto lightly floured (still from that remaining 1/2 cup) surface, flattening gently to break up any large bubbles. Divide dough into two equal pieces. Press each piece into a 9-by-12-inch rectangle. Fold in short ends of dough until piece is about 6 inches long. Roll from one rough edge, pinch seam to seal and roll gently to form a tight log the length of pan. 7 During the last 20 minutes, heat oven to 450F/230C/Gas8. Put loaves in oven and reduce heat to 375F/190C/Gas5. Bake for about 45 minutes or until loaves are golden brown, shrink from sides of pans, and bottoms of loaves sound hollow if tapped. Remove immediately from pans and let cool on wire rack for 1 hour. Wrap well as soon as bread has cooled thoroughly. 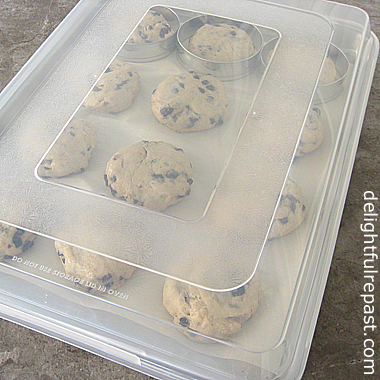 Store at room temperature or freeze in zipper freezer bags. Yields 2 loaves. Perfect Scrambled Eggs—Now there’s a claim! This is one of those dishes that even experts can’t agree on. It all comes down to what you like. 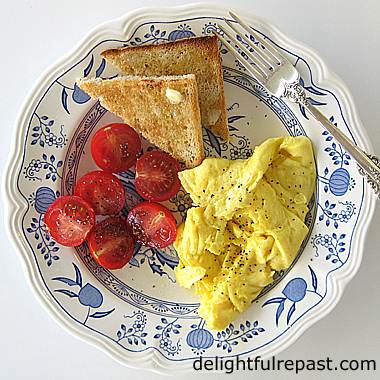 If you are perfectly happy with your scrambled eggs, skip right on down to the Le Creuset pan. I won’t be offended. But if you’re not quite sure your scrambled eggs really are the be-all and end-all, stay with me here. Of course, all you’ll get is my opinion. For every so-called expert who insists you must do or add something, there is another of equal stature who insists on just the opposite. I like scrambled eggs that finish in soft, fluffy folds rather than tiny pieces of egg that look like a pile of gravel on the plate. They should look slightly moist, but not wet or gooey. If they look matte/dry or, heaven forbid, browned, they are overcooked and rubbery. How is this "perfection" accomplished? I’ll tell you in the recipe, but let’s start with the pan. A slope-sided (rather than straight-sided) pan of the proper size for the number of eggs is key. I’m usually scrambling 4 to 6 large eggs, so a 10-inch pan is perfect. Should you beat the eggs in a bowl or right in the pan? Beat them in a bowl, vigorously, with a whisk, for 30 seconds or so, right before you pour them into the heated pan. Add milk, cream or water? None of the above! Just eggs. Salt or other seasonings? No. Just eggs. As I’ve said before, such as in my How to Make Crepes post, maybe it's one of those anti-everything all-natural organic old hippie chick things, but I'm not crazy about (translation: I hate) nonstick pans. But ... I do use a well cared for, high-quality nonstick pan for a few things—omelettes, scrambled eggs, crepes and pancakes (or gluten-free pancakes). My everyday skillet is uncoated tri-ply stainless steel, my preferred pan for cooking steaks, chops, anything I want to brown. And I’ve actually perfected the art of cooking eggs in it with almost no sticking, but it takes a lot of concentration! The nonstick version doesn’t give me a problem even if I’m distracted or half asleep! And, squeamish as I am about ingesting chemicals or fumes, I’m quite confident that a properly used and cared for, high-quality nonstick pan used occasionally is not going to hurt me. Of course, I treat my nonstick pans properly because I also don’t like having to throw things away because, as you know, there is no "away." Unlike with other pans, never preheat empty or over high heat. Rub a little oil or butter (I use about 1/2 teaspoon) onto the cold pan—don’t use cooking spray—and heat over low to moderate heat. Use non-metal utensils that are not sharp or rough so as to not scratch or nick the nonstick surface. Once you’ve damaged the nonstick coating, it’s all over for that pan. Allow to cool completely before immersing in water or filling with water. Hand-wash with a sponge or cloth. And never stack another pan inside a nonstick pan. If you must stack, put a dishcloth between the pans. Now for the recipe. Oh, and do tell me how you like your scrambled eggs. 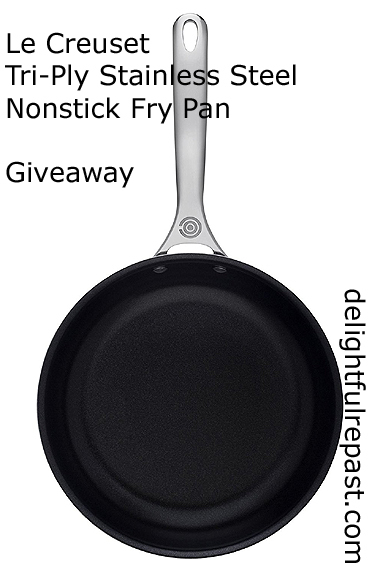 And be sure to enter my giveaway of a Le Creuset Stainless Steel 10-Inch (26 cm) Nonstick Fry Pan, a heavy tri-ply pan that retains and distributes heat evenly so there are no hot and cold spots! 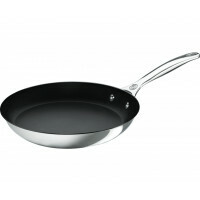 1 In 10-inch nonstick skillet over medium-low heat, melt the butter. Note: Actually, Number One is make sure everything else is ready and the diners are at the table before you even start. If you're having toast or whatever, it needs to be done before the eggs go into the pan. 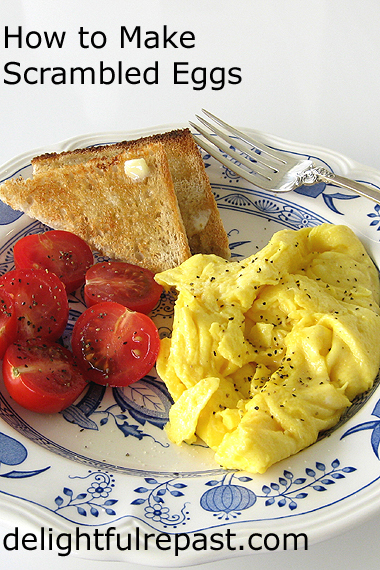 There's nothing worse than scrambled eggs that have been waiting around! 2 In a 1-quart bowl (I use a 4-cup glass measure), whisk the eggs vigorously for 30 seconds or so. Note: I had a friend who insisted that whisking the eggs right in the pan with a fork was the way to go, but her scrambled eggs always had white streaks - a big major unappetizing no-no for me. 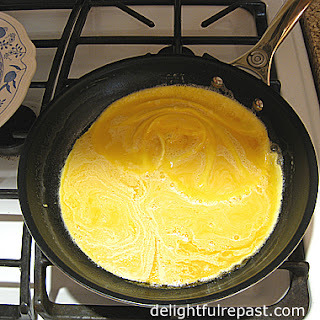 3 When the butter is bubbling (but not browned), pour the eggs into the center of the pan. Do not stir. 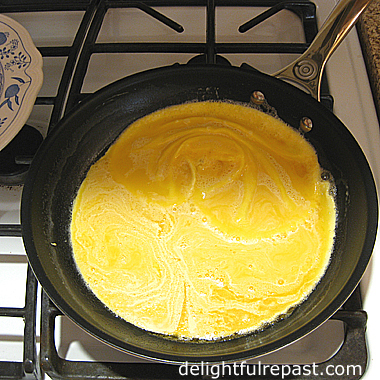 4 Cook over medium-low heat, without stirring, until eggs begin to set at the edges. The eggs pictured in this post are actually not as "Perfect" as usual because I cooked them a little too long before starting to push them around with the silicone spatula. But that's how it goes when you're trying to cook and photograph at the same time! 5 When the edges are starting to set, draw a heat-resistant silicone spatula across the bottom of the pan. Uncooked egg will flow into that area. Wait several seconds. Repeat a few times, forming large curds. 6 When the eggs look about one minute away from done, take the pan off the heat; the eggs will continue to cook. Plate; sprinkle with salt and pepper; garnish with chives, cilantro, flat-leaf parsley or tarragon, if you're being fancy; and serve right away. This giveaway is open to US residents* 18 years of age or older. Leave a comment below (one entry per person, plus see below for ways to get up to two bonus entries). First comment should be about the first thing you'll make in your 10-inch nonstick fry pan. Please include your email address in the body of your comment. Must enter by 11:59 p.m. Eastern time Wednesday March 14. * If you are outside the US but would like to have this sent to someone you know in the US (you would have to send them a gift card separately on your own), go ahead and enter! Winner will be chosen by random drawing and be announced here in the comments before noon Eastern time on Thursday March 15. If I don't hear back from the winner of the random drawing by noon Eastern time Sunday March 18, another drawing will be held and a new winner selected from the original entrants (those who commented before the giveaway deadline). Disclosure: Le Creuset provided a pan for review purposes and one for the giveaway. The views expressed here are entirely my own. I always tell my readers what I really think! 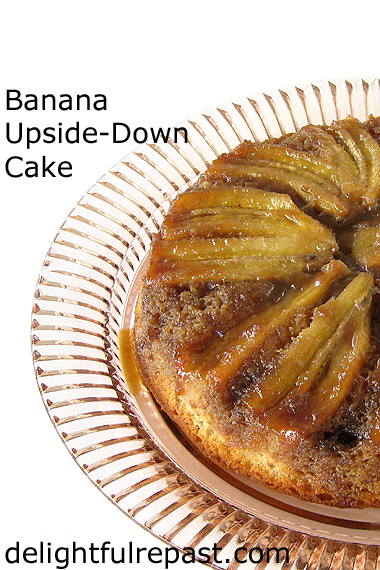 Banana Upside-Down Cake came up into my “queue” because I’ve been craving bananas lately. Wonder what that means? Anyway … I’ve made my Small-Batch Banana Muffins a couple of times lately (love them! ), so thought I should do something different with the bananas today. Usually, if I add nuts to an upside-down cake, it’s walnut or pecan halves worked into the pattern of the fruit on the bottom (that will be the top), but I had finely diced walnuts left over from my muffin-making and thought I’d just throw those into the batter. If you’re allergic to nuts, you can leave them out of the recipe without having to make any adjustments to it. 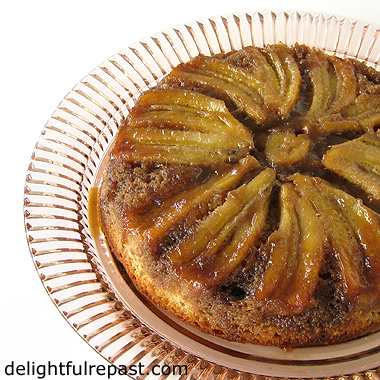 We enjoy the cake with some unsweetened (you might prefer lightly sweetened), softly whipped cream. 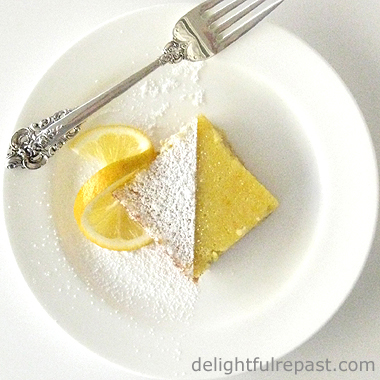 A 1/8-of-the-cake serving comes in right at my daily sugar allowance! If you like it, I hope you'll share the link on your social media and with all your friends, relatives, coworkers and assorted pets! And do leave a comment and tell me about your favorite ways with bananas or whatever! Don't forget to Pin and share! 1 Preheat oven to 350F/180C/Gas4. Grease a 2-inch deep* 8-inch round Pyrex baking dish or cake tin with unsalted butter or cooking spray. Line the base with a round of baking parchment. In small saucepan, melt 4 tablespoons of the butter, mix the brown sugar into it, then spread the mixture evenly over the baking parchment. Place banana halves, cut side down, in a pleasing pattern over the sugar. Set aside. * It is important that the pan be 2 inches deep. If it is shallower, the batter might run over. 2 In 1-cup glass measure, stir cider vinegar into milk; let stand a few minutes while you proceed with recipe. In mixing bowl, combine all the dry ingredients and mix on low speed for one minute to blend. Add the 5 tablespoons softened butter, milk, and vanilla. Mix on low speed for 1 1/2 minutes, then add the egg and mix 1 1/2 minutes longer. Note: Or do it by hand, as I usually do. Just whisk together the dry ingredients; use your fingers to work the butter into the dry ingredients; add the milk, egg and vanilla; beat by hand for a minute or two. Couldn't be easier! 3 Spread the batter evenly over the bananas. Run a knife through just the batter, not disturbing the bananas, a couple of times to break up any large air bubbles. Bake for 35 minutes. Do not underbake. You're going to be turning it out onto a plate while it is hot, so a nice crusty top (that will be the bottom) is not a bad thing! 4 Remove from oven, loosen edges with knife, and invert immediately onto a plate. Let it cool completely before serving with whipped cream (unsweetened or lightly sweetened, with a dash of vanilla extract).